I spent my lunch break the other day just looking at this thread (and getting hungrier even as I ate). I'll add to the chorus that it's chock full of beautiful photos, great explanations, and dishes I'd love to try myself. I thought I didn't know Dutch cooking at all but this all seems to familiar and comforting at once. Great job! suzi, this one's for you.. I never read one of Betty Neels' novels but I can just imagine the heroin in one of her novels munching on these cookies while waiting for her dashing beau.. Your pik in 't potje recipe brought me back to the vacation we took during the summer of 2003, during which my husband and I spent a week riding our tandem bicycle through the roads of Zeeland. Glorious time. One of the discoveries we made on that vacation was vla, bought from the grocery store in a carton like a milk carton. We drank a liter of chocolate vla every day, straight from the carton. And then we cycled back into Belgium and it disappeared from the store shelves. Do you have a recipe for vla? Or is it something that everyone buys from the store? I can just imagine the heroin in one of her novels munching on these cookies while waiting for her dashing beau..
Vla, in all kinds of flavours, is definitely the nation's favorite dessert. It's a thick custard, really.. but the kind you buy in the store does have a sort of thick gooey gummyness that I think is preferred by most people over homemade. I make custard from scratch (with eggs & milk or cream) to use in desserts but I actually think of it as a different product. 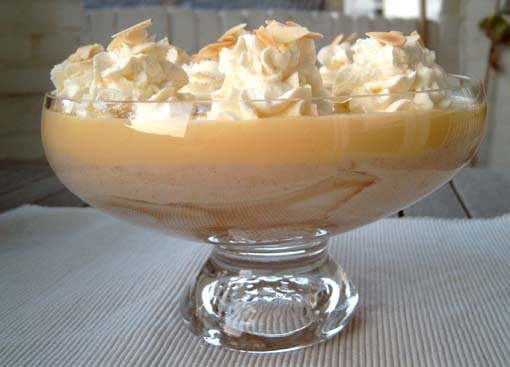 Custardpowder will give you a result that is more like the storebought vla, I think. 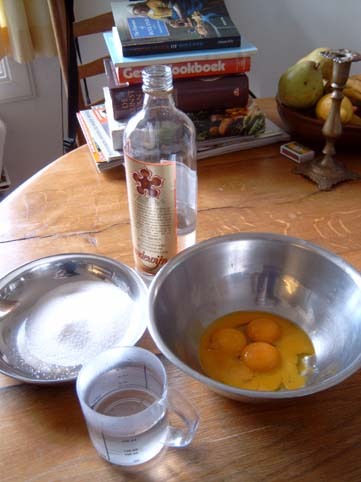 Advocaat is a delicious 'drink' made from eggs, dutch brandy and sugar. A drink made from alcohol and mashed avocado's was introduced to the Netherlands from their colonies in the Caribbean. With their usual inventiveness when it comes to substituting ingredients, the Dutch started using eggs for the drink, but the name of the avocado stuck. The factorymade product is very thick and bright yellow. For this thread, I wanted to make my own so I did some research for good recipes. I found about a dozen of different recipes.. with great differences as to the ratio of eggs/sugar, alcohol. Some recipes said to use whole eggs, others just yolks. Some recipes said to cook au bain marie, others in the microwave, others said not to cook at all. 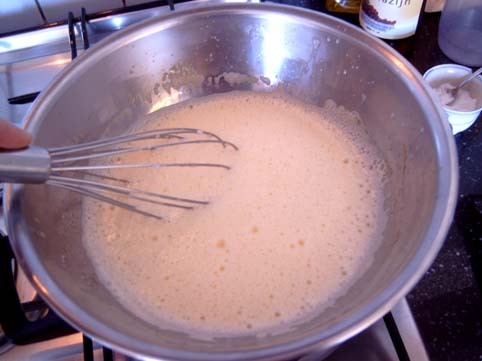 Some used spices, cream or condensed milk in addition to the 3 main ingredients. Some used 93% alcohol, others Dutch bransy.. very confusing.. I ended up reading all the recipes and making up a recipe that seemed to make the most sense to me. Mix the yolks with the sugar until foamy. Add water and brandy. Put the bowl over a pan with hot water and cook, whisking, au bain marie until thickened. After about ten minutes it suddenly 'seized'and became thick. I was worried it might curdle so I stirred like crazy and guess what.. it turned thin again.. This happened two more times.. really frustrating.. After the third time, when it started to thicken, I stopped stirring and ladled the stuff into a jar. It's not as thick as I would have liked but I guess it will thicken some more as it cools. It tastes divine though. I licked the entire bowl which was somewhat of a guilty pleasure at 11 in the morning.. 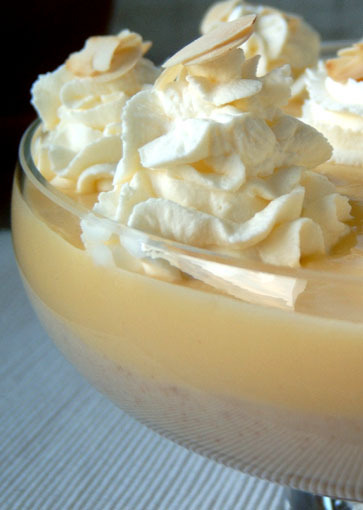 This would traditionally be served as a 'drink', in small crystal glasses, topped with sweetened whipped cream. It is delicious served over icecream (with whipped cream on top), as a substitute for custard in trifles, or as a sauce for strawberries. Or simply serve in small glasses for dessert, with biscotti for dunking. Is Dutch brandy different from, say, French brandy? And with that cooking, is there still a decent amount of alcohol left? I'm dying to make this! The word brandy was actually derived from the Dutch word brandewijn, which means ‘burnt wine’ – wine boiled to distill it. In the 16th century Dutch traders introduced this drink to the countries of Northern Europe after they encountered it in the Mediterranean. The Dutch however, soon started making their own 'brandy' without wine but using malt instead. That’s still what Dutch brandy is made of, contrary to wellknown brandies such as Cognac, Calvados, Grappa etc. Dutch brandy has a very neutral taste which makes it ideal for preserving. This has 34 % alcohol . Abra, what do you mean by French brandy. I'm sorry.. but sometimes it gets confusing with all the languages, what means what where, etc.. see my explanation about dutch brandy above. If by french brandy you mean cognac or something, no I would not use that. Use some kind of alcohol of about 30 % that does not have too pronounced a taste.. although I read one recipe from a Dutch woman living in Canada, who said she uses rum instead.. I can imagine that being delicious.. although I do think some of the delicate flavour of the egg will be lost.. Since you don't really cook the advocaat, but only heat it very slowly au bain marie to thicken it, the alcohol does not cook off.. so you really get the kick of the alcohol in the taste, mellowed by the eggy sugary creamininess..
Chop up all the vegetables in fairly small dice. Clean the mussels. Put them in a pan with 1 liter water and salt. Bring to a boil and cook for about 10 minutes, until all mussels have opened. Drain, (saving the cokking liquid). Sieve the cooking liquid. Take the mussels out of their shells. Melt the butter in a large pan. Saute the vegetables in the butter for about 15 minutes. 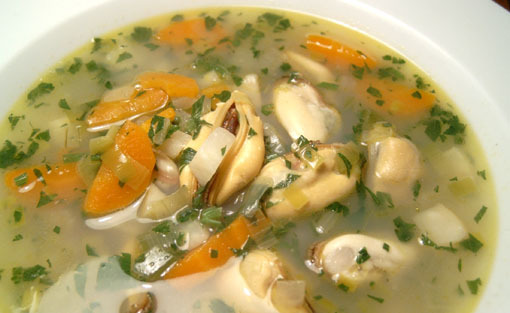 Add the mussel cooking liquid to the vegetables and cook for 10-15 minutes, until the vegetables are well done. 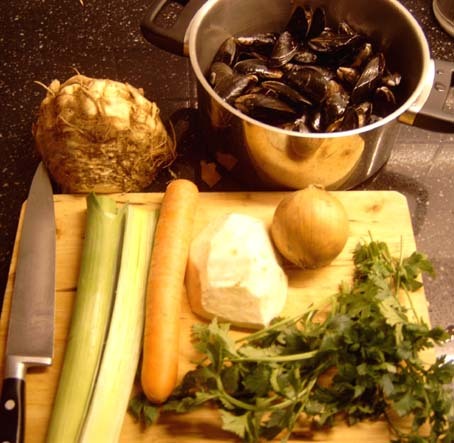 Chop up the herbs and add those to the pan, together with the mussels. 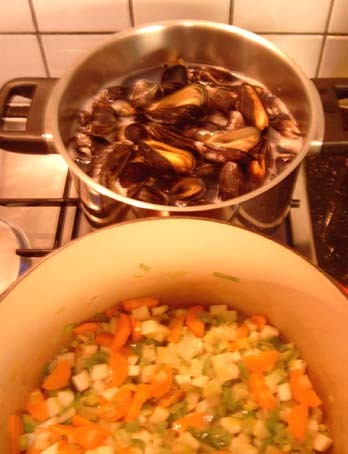 Heat through briefly (or the mussels will be tough from overcooking) and serve, with good bread & butter. 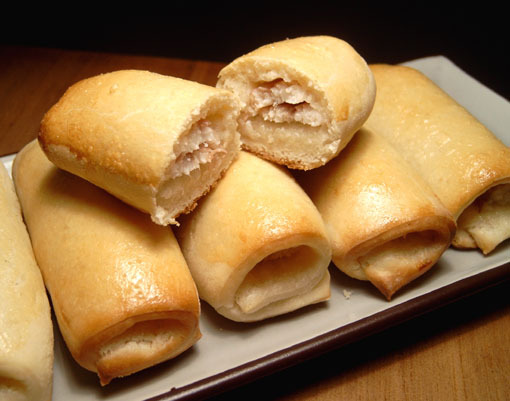 I also made another recipe from Zeeland, Palingbroodjes - smoked eel rolls. Make a dough from 250 grams of flour, 150 ml. 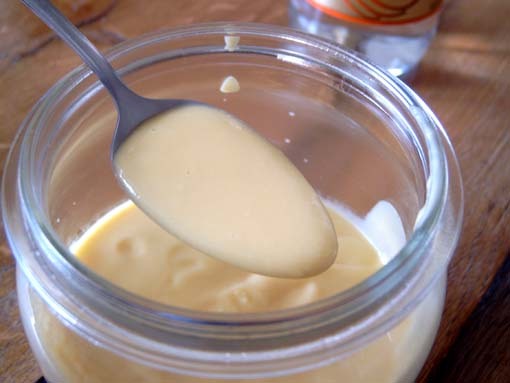 warm milk, 20 grams melted butter, 1 sachet (7 grams) yeast, 1 teaspoon salt. Mix well and knead for 5 minutes. Leave the dough to rise for about 1 hour. Roll out into a large rectangle and cut into 10 small rectangles. 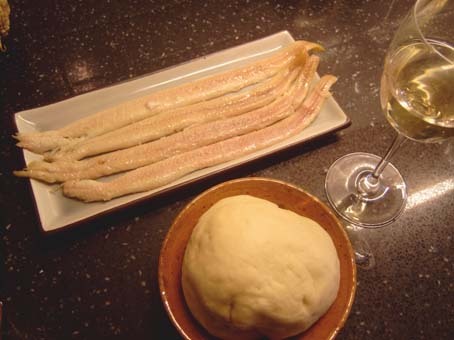 Cut 200 grams of smoked eel fillets into pieces the same length as the dough rectangles, and divide among the pieces of dough. Moisten the long edge of the dough pices with some water and roll up. Don't pinch the ends, the fish should remain slightly visible. Put them on a buttered baking tray. Laeve to rest for about 15 minutes, then brush with beaten egg and bake for 15-20 minutes unitl risen and golden. These were fantastic!! And so easy to make! I'm thinking smaller sized ones would make a perfect hors d'oeuvre.. The fatty juice from the smoked fish permeates the bread, delicious.. I'm totally drooling over those eel rolls! I only see eel in tins, Japanese style, and I love that preparation. I wish smoked eeel existed in my world. Sorry, I had missed your previous explanation of Dutch brandy. I'll have to Google around and see whether it's available anywhere here. Well, for whatever reason the cafeteria choices were very average that day and my hosts apologized for not having anything "special" in that day's lunch service. First, let me say that everything I ate there was very good. Some things were more memorable then others but they were all good. On that particular day, I had the good fortune to get what they referred to as "Farmer's Stew". My hosts didn't know all the English names for what was in the dish but, I managed to make a close approximation when I went back home. Think of classic comfort food on a dreary overcast day. 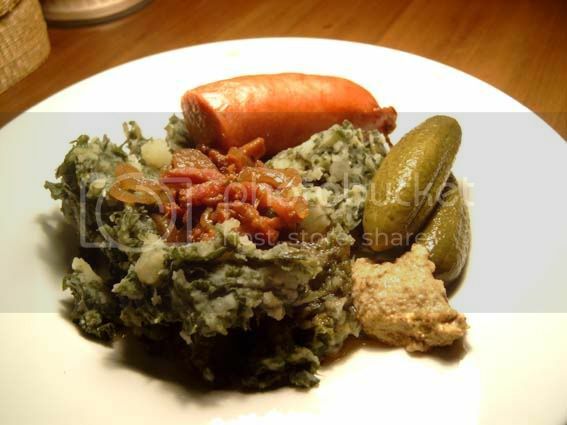 Mash a bunch of potatoes, add diced ham, blanched Kale, and some green onions and top with a wonderful brown gravy That was the perfect meal for that particular day and was a wonderful dining experience even though it was below standards according to my hosts. I don't know how close my recipe follows the classic Dutch Farmer's Stew recipe but, it goes over very well when I go back home to Oklahoma and make it for the family. My sister liked it so much, she took home all the left overs and asked for the recipe. Sid, I think what you are referring to is boerenkoolstamppot Boerenkool is the dutch word for kale, and translted back to English, boerenkool would mean 'farmer's cabbage'. So here's what I did with the advocaat I made on saturday. 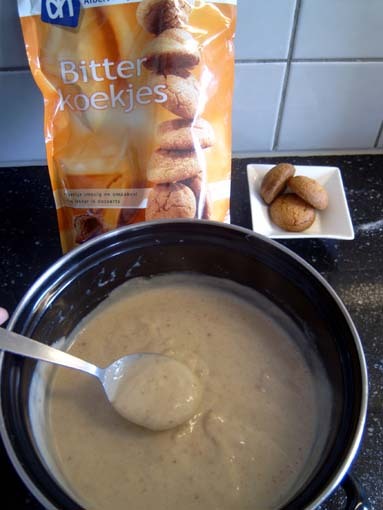 Bitterkoekjes are almond cookies/biscuits. I don't know if they are available outside of the Netherlands. They are soft and very chewy.. they taste like Amaretto di Saronno without the alcohol. When you cook them in milk they dissolve. Add cornflour to thicken. Depending on how much cornflour you use, you end up with custard or pudding. Mine was something in between! Oh my god, that dessert looks awesome. Bitterkoekjes sound like they're made with bitter almond, which isn't much in use here. We can get bitter almond oil from a few online suppliers, but I've never seen the cookies. Come to think of it, maybe the cookies are available online as well, or maybe it would work with regular almond macaroons. That is just gorgeous! I feel like a junkie each time I come back to this thread. Can-not-get-enough-of-Dutch-cooking. The eel rolls look fantastic. Should be adaptable to other types of smoked fish. Yum. Bitterkoekjes sound like they're made with bitter almond, which isn't much in use here. We can get bitter almond oil from a few online suppliers, but I've never seen the cookies. Come to think of it, maybe the cookies are available online as well, or maybe it would work with regular almond macaroons. or maybe Italian amaretti? I never had those, but I'm assuming (from the name) they have that bitter almond flavor? I hope to keep you happy with lots of new fixes sanrensho.. I was thinking about that. I think smoked salmon will not be able to take the heat of the oven.. I personally don't like smoked salmon when it's cooked. other kinds of smoked fish, yes. Or (for something completely different) this would also be a great dough recipe to use for sausage rolls. The dough is easy, fast, and the finished result is wonderfully light and fluffy. Where did the smoked eel part of that recipe come from? 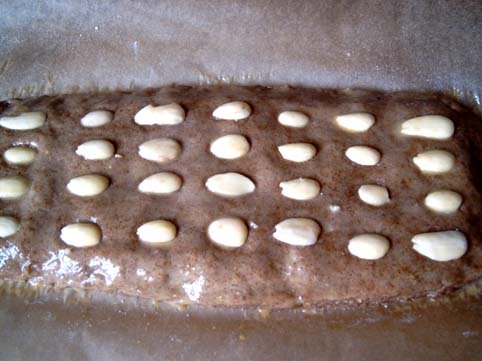 Are they freshwater eels, and is it a common element of Dutch cooking? They look great though! smoked eel is a dutch specialty.. it's ususally eaten cold, with bread.. I think the eel rolls were originally made with fresh eel, but because that's only available for a limited period per year, there's now a recipe to make them with smoked eel. Here's what the smoked eel looks like before it's stripped of it's skin.. I will have to see if our new Stop and Shop has the good gingersnaps. Klary, I made the Draadjesvlees recipe tonight. We had it over basmati rice, liberally doused in the braising sauce. So simple, so good. Now I have to know: How do you pronounce "Draadjesvlees"? Actually, it would be really helpful if you could include the pronunciations for some of the less obvious names (Bitterballen I can figure out, but not Draadjesvlees). 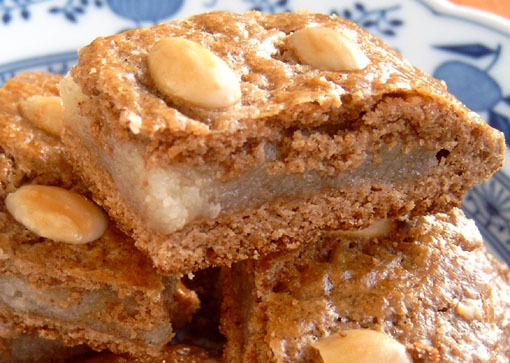 Speculaas is the Dutch pastry associated with winter (in summer you can buy them, but I don't think many people eat them) and especially with the Dutch celebration of Sinterklaas. Sinterklaas (St. Nicholas) is celebrated on December 5th. It is traditionally a children's feast, for young children who still 'believe' that this man in a red cloak, with a long white beard, sitting on a white horse, with his bishop's mitre and surrounded by his (very politically incorrect) black little helpers called Zwarte Pieten (black Peter), is a real person who lives in Spain all year and who comes to The Netherlands every winter to reward the children who have been good with presents, and to punish those who have been bad by putting them in an bag and taking them home to Spain. But adults love this celebration as much as children. This a day when you give each other presents anonymously, often these presents are wrapped up in something completely different (for instance, a book can be buried in a bowl of dirt or hidden in a doll's house). Sweets are a large part of this celebration. Marsepein (marzipan) is formed and coloured into every imaginable shape (one of the most popular is bright pink pigs). Everybody gets his or hers initials in large chocolate letters. Pepernoten are everywhere in large bowls to munch on. 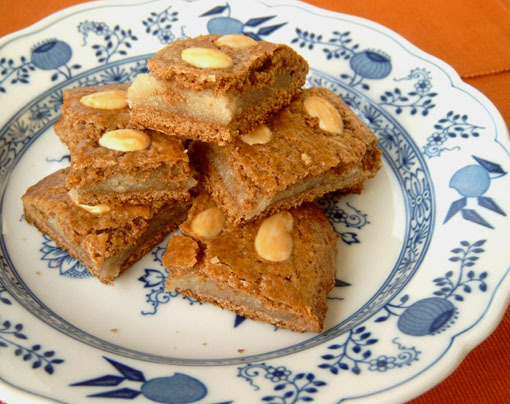 And speculaas, in different shapes - as thin cookies, as large crunchy chunks, or filled with almond paste. The smell of speculaas pastry is everywhere these days, when you pass a bakery this wonderful spicy scent comes wafting out into the streets. Today I made it myself. 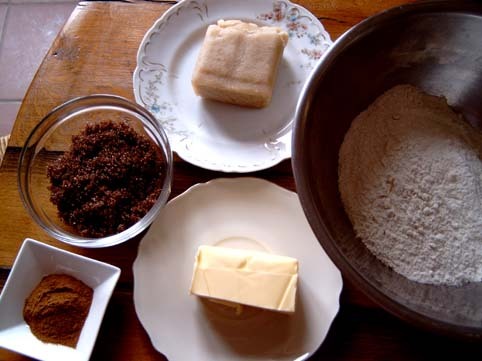 For speculaas, you need the special spice blend. You can buy it readymade over here but you can grind your own. cinnamon, cloves, nutmeg, ginger, aniseed, coriander, cardamom, in a ratio: cinnamon 3 : cloves 2: nutmeg 2: ginger 1/2: aniseed 1/2: coriander 1/2: cardamom 1/2. You can add some white pepper if you like it really spicy. Make a dough by mixing the first 5 ingredients together, adding some milk if you have to, to make it come together. Divide into 4 equal parts. Mix the almond paste with the lemon zest and the cream until you have a spreadable mixture. 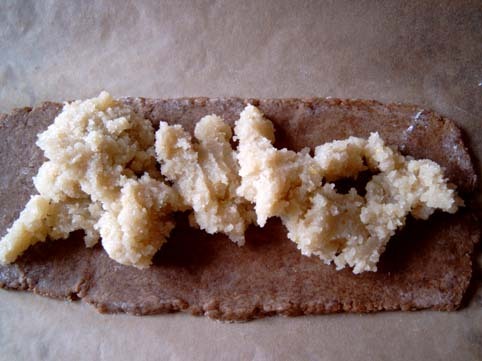 Roll out tow parts of the dough into a narrow rectangle. Put unto a buttered baking sheet (or one lined with baking parchment). Spread the almond paste on top. It will still be pretty stiff. Carefully spread it over the pastry with the back of a spoon, wetting it to keep the paste from sticking. Roll out the other 2 parts of the dough and place on top. Press the edges to seal and trim all around with a knife. Press the almond halves on top and glaze the two logs with the beaten egg. Bake at 180 C / 350 F for 20- 30 minutes. Cut into small pieces (it's very rich) to serve. I'm glad you liked it. And I'm honoured that not only do you want to cook Dutch food, now you want to be able to say Dutch words as well.. I have no idea how to fonetically transcribe Dutch words. Ill try to find out! And I'm honoured that not only do you want to cook Dutch food, now you want to be able to say Dutch words as well.. I bet I'm not the only one interested in learning how to pronounce the words. And it's a lot more interesting than referring to a dish as just "Dutch-style butter braised beef." One very easy and very effective way to show pronunciation is to use established words as a reference. For example: shochu ("sho" as in long "show", "chu" as in long "chew"=show-choo). I don't know if this will work in Dutch!